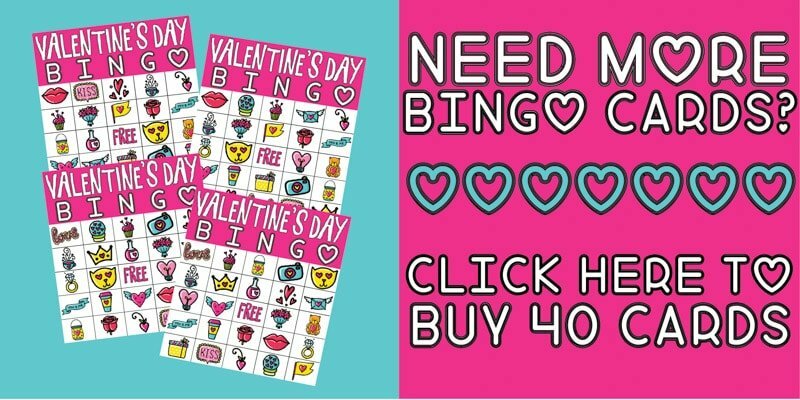 Looking for a fun Valentine bingo game to play at a Valentine’s Day party? 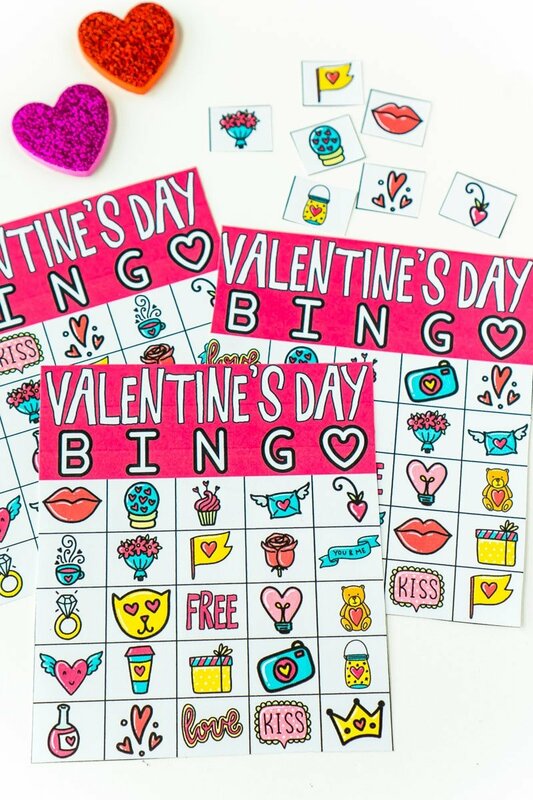 These Valentines Day bingo cards are perfect for classroom parties, couples parties, Galentine’s Parties and more! Combine them with these Valentine’s games for an event all your guests will love! This post contains affiliate links. If you purchase via these links, I may receive a small commission at no additional cost to you. One of my family’s traditions for Christmas Eve is to play bingo. Ever since my son has been old enough to really understand the game, he’s been absolutely hooked on bingo. I’m pretty sure he was the most excited one to play Super Bowl commercial bingo earlier this month, even more than the adults who actually cared about the game! So lately I’ve been creating bingo games for his class at school and church to use. And honestly, just as a fun after school activity. He doesn’t care that he’s not playing against anyone – he just likes to play! 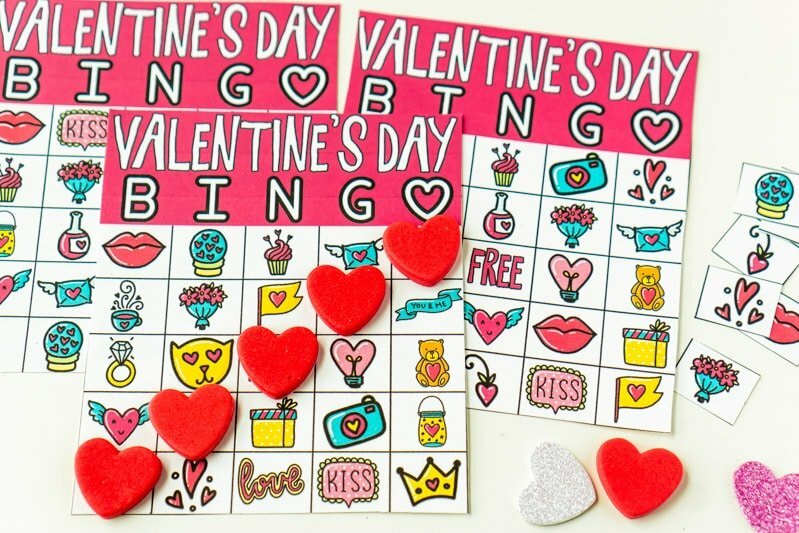 Last year we did this Valentine’s Day scavenger hunt (he’s also obsessed with scavenger hunts) and this year, I made these brand new Valentines Day bingo cards and these Valentine’s Day memory games. Each of the cards is full of cute Valentine’s day images that will appeal to players of all ages! There are twenty-four different images so everyone will have each of the images on their cards, just in different places, which means they’ll be called in a different order. I decided to go with this route because with kids, sometimes they lose attention or get frustrated when they can’t find the images on their cards. So every image is on every card. Makes it a bit easier than say this love story Valentine’s Day game! If you’ve ever played bingo, this is going to be very similar. If you have any questions about the instructions, feel free to leave comments and I’ll do my best to answer them! Before the game, make sure to answer and announce these questions. Can people bingo more than once or after they bingo are they out of the game? Will you do multiple bingos before people have to clear their card or one bingo, clear cards and start again? What will be a bingo? Will you do traditional or a non-traditional bingo (see examples below)? Give everyone a unique bingo card. You’ll want people to have unique cards or else two people will bingo at the same time, which may still happen with all unique cards, but at least it’s not guaranteed to happen. Give people some sort of markers (or these bingo stampers) to use for the game. If you’re going to play multiple games with the same cards, skip the bingo stampers and go with markers they can put on and take off each game. 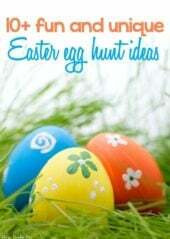 Cut out the master images and put them in a baggie, bowl, or hat of some kind. Place the master list in front of you and get ready to play. 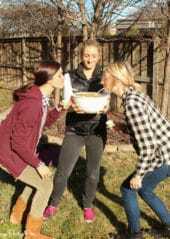 Pull one image out of the bowl at a time and call it out to the group playing. Since these are images and not numbers like traditional bingo, I recommend describing the image (e.g., cupcake or three red hearts) and showing the images to the group as well. Place the master image on the master list to keep track of what’s been called to verify anyone who bingos. Everyone covers the matching image on their card. Repeat, calling out images until someone has five in a row horizontal, vertical, or diagonal. Or switch it up all together and instead of doing traditional (five in a row) bingo, have people cover the four corners, a postage stamp (four together), or whatever else your heart desires. First person to bingo wins a prize! 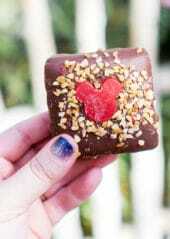 I have a list of prize options below but these pretzel hearts would be a great option! 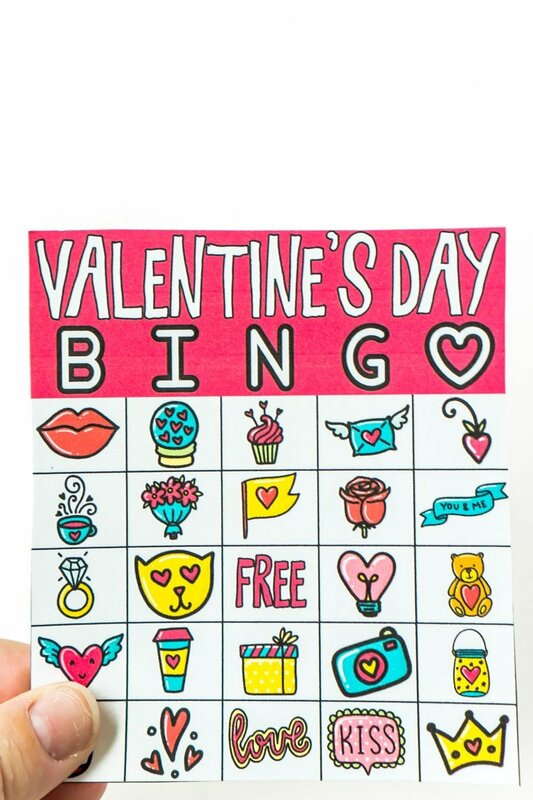 Either continue playing for more bingos or have everyone clear their Valentine’s Day bingo cards and start fresh again. 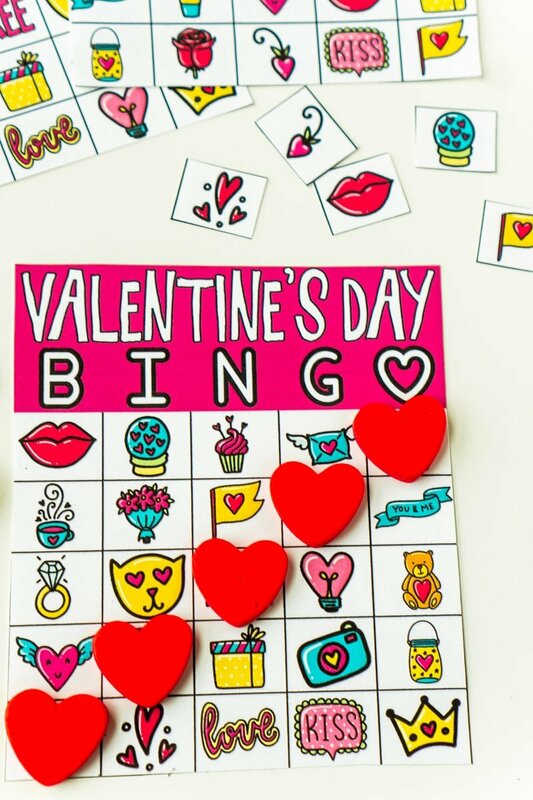 I’ve included both big and small Valentines Day bingo prize ideas depending on if you’re playing say with a bunch of kids at a Valentine’s Day classroom party or playing at a couples party where only one person bingos! Choose your prize depending on the age and situation of the players. I’ve created a set of 16 unique Valentine bingo cards you can download for free using the form below. Simply enter your first name and email address to be sent directly to the PDF of the bingo cards and receive an email copy for later. If you don’t see the form below, click here to get to it. The PDF will also include a master list to use for the images + keeping track of which images are chosen. If you need more than 16 unique cards, I’ve created a larger set of 40 cards you can purchase for a low price by clicking here or by clicking the image below. 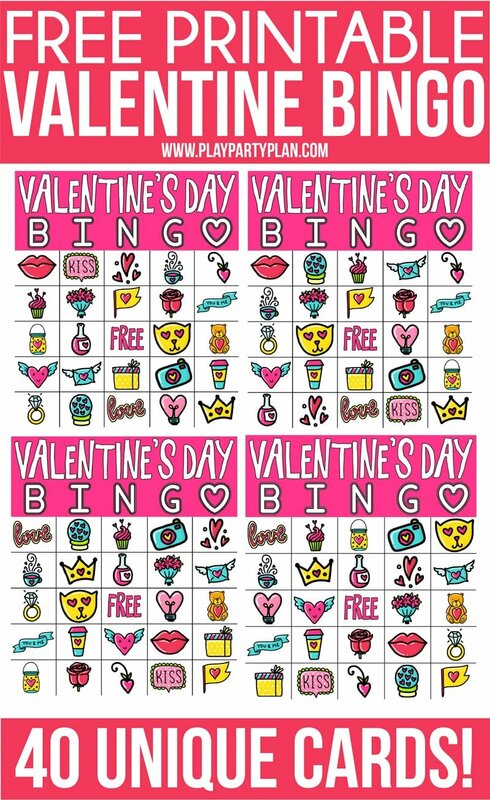 Don’t forget to pin these Valentine bingo cards for later! 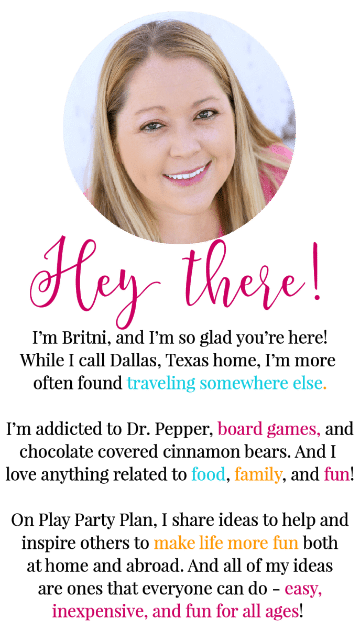 Love your printables and games with suggestions to go with them.